The plight of the turtle dove and the work of dedicated farmers, landowners and conservationists in trying to save it is well known. But how can the world of planning policy and local councils help to save this bird? With limited resources, conservation organisations have to target where they can most effectively do this work. Looking at the available survey data, RSPB researchers have identified the core areas where numbers of turtle doves are still at their greatest. These have been given the snappy title of “Turtle Dove Friendly Zones” or TDFZs for short. 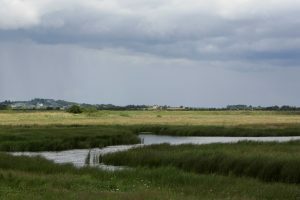 One of these zones sits around the Blackwater Estuary in Essex, which in its own right is one of the top twenty most important sites for wintering waterbirds in the UK. The RSPB’s Old Hall marshes reserve sits within this zone. Emma Stobart, the RSPB’s Turtle Dove Conservation Adviser in Essex, is active here working with farmers who want to help one of the UK’s most threatened species. “the network of natural and semi-natural features within and between our villages, towns and cities. These features range in scale, from street trees, green roofs and private gardens through to parks, rivers and woodlands. At the larger scale, wetlands, forests and agricultural land are all captured by the term GI”. It is important also to remember that water (rivers, ponds, canals) are part of the GI for an area. Good GI can have so many benefits – improving the image of an area (making it an attractive place to live); reducing air pollution (think of all those trees sucking up Carbon Dioxide), inspires people to be more active (who doesn’t want to go for a walk in a nice leafy park? ), plus of course benefitting wildlife. Maldon District Council – the first to plan for turtle doves? Last week, Maldon District Council launched a public consultation on their Green Infrastructure Strategy, a consultation that anyone can comment on up until 4.30pm on the 23 January 2019. In preparing this document, the council held a number of workshops to which they invited a range of organisations to seek their opinions and gather ideas. Here, Emma was able to promote the work of the TDFZ. We’re extremely pleased that the council has recognised the value of her work and included this in the draft strategy. Maldon could well be the first council in the UK to recognise the Turtle Dove in planning policy – top marks for that! So what does this mean? Once the consultation is completed and comments are analysed, the strategy will be adopted by the council as a Supplementary Planning Document (SPD). SPDs are a ‘material consideration’ in planning. Essentially, they carry some weight when planning decisions are made – they can’t just be ignored. This will be a useful extra tool that will help Emma, her farmers and other organisations to help save the turtle dove. If you are interested and want to have a read of the strategy or make a comment supporting the initiative Maldon District Council have shown, here’s the link to the Green Infrastructure consultation. Details of the TDFZ can be found on pages 13 and 18 of the Strategy. After you have done that, why not look at your local council’s GI strategy to see what they are doing for nature.